Did you know people still do quilt bees? No? Me neither. I don’t know about you, but I certainly had a misconception about quilting bees. The imagery in my head immediately goes to a group of elderly ladies with needle and thread sitting in a circle in a church basement. They’re having a great time talking about their grandkids, but I definitely do not fit in there (I AM their grandkid) and the quilt they’re working on is definitely NOT to my taste. You there with me? Okay, now come here. The ladies working on the quilts in this quilting bee are in their 30s (and 20s and 40s and 60s … ). 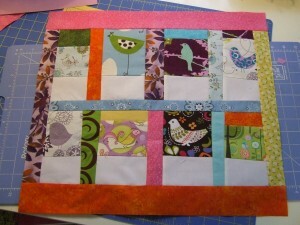 They are quilting on digital sewing machines using bright fabrics with modern designs. Mostly, they sew on their own, but the social aspect of the quilting bee is not in the church basement, but with online friends, where they mail bits of quilts all around the country and the world, so in the end, they have the aspect of working on one quilt, together, as a quilting bee. They share photos and ideas and discuss the projects online. 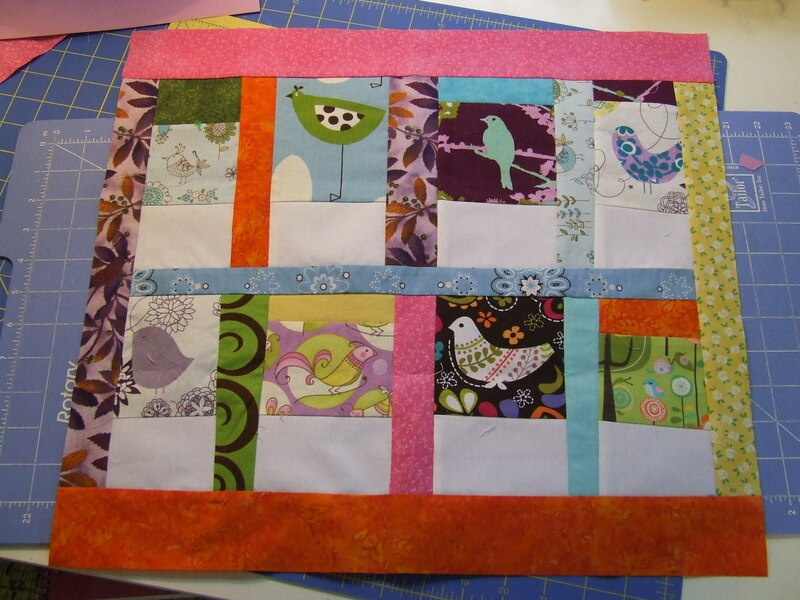 My first experience with the modern, online based quilting bee was the 4×5 Bee, where I made blocks for 5 other quilters over the course of one quarter, and they each made a block for me, in my chosen colors. (I’ll post soon about the awesome blocks I received.) 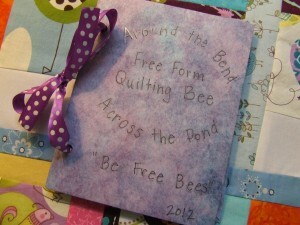 I’ve already signed up for the first quarter of 2012 in that quilting bee and will be getting my “hive” assignment soon. 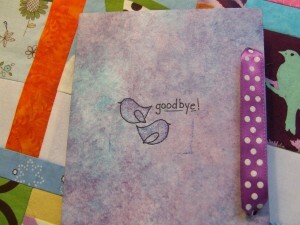 Meanwhile, in an effort to keep my creative muscles fresh, I joined a Free Form Quilt Bee. I was a bit tentative at first because I didn’t really know what to expect, but the concept intrigued me. 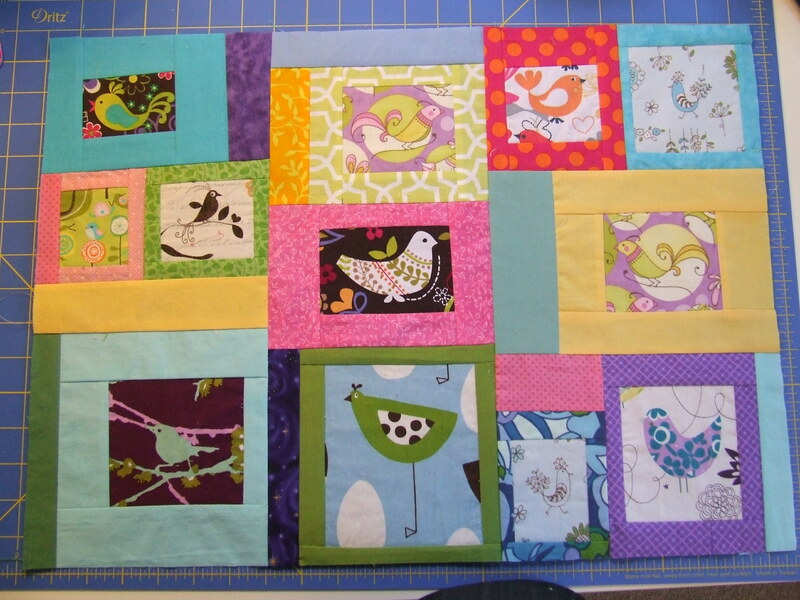 Basically, I send out a starter piece of a quilt, and over the course of the next several months, the quilters in my group add to it however they see fit, thus the “free form” aspect of this project. Each month, my (larger and larger) starter piece will be mailed on to someone else to add a little something to it. At the end of August, I will get back a much larger project. Next up: a signature block. Each person who works on this quilt will sign a bird, so when the project is finished, this will be incorporated in to the back so I will have a memento of all the hands that helped to complete my quilt. For this group, we also decided, collectively, that we would include a little journal with our starter blocks to be sent along to each stop. The intention is to share our inspirations and creative processes so that the owner of the quilt knows where each addition originated. 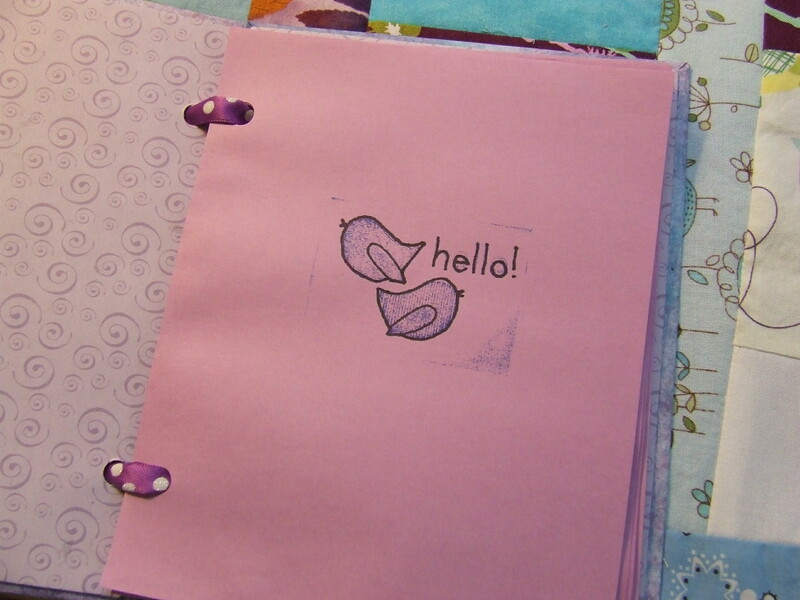 I happened to have this little bird stamp, which fit perfectly in with this project. I will have photo updates over the course of the next several months, but I can’t wait to see how it looks when it comes back to me. It’s all packaged up and ready to mail to the UK tomorrow! Last quilting bee I participated in was about 7 ladies ranging in age from early 20’s to late 50’s, all dressed in civil war era clothes, sitting in a friend’s parlor. (Yes, I have a friend with a parlor.) 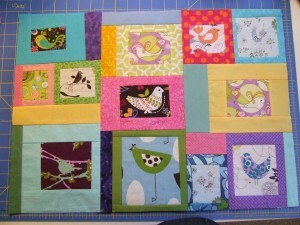 We hand sewed blocks that will one day be put together into a friendship quilt. Antiquated? There was only one grandma there. Most of us were young. We had a great time talking about normal things when there were no spectators around and “the war” when there were.